"We refuse to keep silent!" 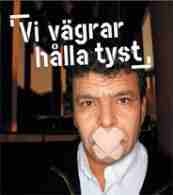 Verdict in Labour Court bodes ill for union�s right to freedom of speech in Sweden. In a verdict today, Wednesday June 13, the Swedish Labour Court upheld the right of Veolia Transport to sack the leader of the train drivers union in the metro of Stockholm. Originally, Veolia Transport (then named Connex), said that the reason for sacking Johansson was his alleged disloyalty to the company. Johansson had revealed security [safety] deficiencies in the Stockholm metro to the media. After the sacking, the cause was changed. The cause for discontinuing Johansson�s employment was now his alleged rudeness in negotiation situations. In its verdict, the Labour Court supports Veolia Transport�s action in its entirety. The labour union of train drivers maintains that the freedom of speech within a company should be the same as within the society as a whole. We are convinced that the reason for the sacking of Johansson still is the content of his statements � not the form of them. The verdict of the Swedish Labour Court may be an infringement of the right of free speech as guaranteed by the European Union. We are considering the possibility of taking the case of Johansson�s freedom of speech to the European Court of Justice. The European Worker�s council has expressed its concern and its support for Johansson�s cause and will bring it to the attention to the central leadership of Veolia Environnement in Europe. csenews.net: We wish Per Johansson and SEKO branch 119 all the best in the fight against Connex/Veolia, the company's lack of commitment to safety and its willingness to victimise safety whistleblowers. To victimise someone for exposing Veolia's negligence is disgraceful. Anyone who has met Per Johansson and both officials and rank and file members of the union will know the high level of dedication they have to the health and safety interests of both the workforce and the passengers. They deserve better from the Labour Court (tribunal). It is hoped that any further action by SEKO branch 119 succeeds and that this verdict can be overturned.